The Flash Converter for Excel (Excel to SWF Converter) is a simple and powerful application for converting Excel files to Flash SWF video files. The The Flash Converter for Excel can convert XLS, XLSX an XLSM file formats to Flash individually or in batch mode. The resulting output quality of the Flash files is excellent and the conversion time is fast. The Flash Converter for Excel also preserves the original layout, text, images and tables of the Excel document. 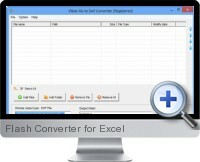 Simultaneously convert multiple Excel files in different formats to Flash in one process. Adjust the image quality as required to limit SWF file size. Modify the Flash SWF video size dimensions. Stretch or shrink the Excel document image to fill the SWF screen size. Zoom and scale the Excel document image for the Flash output. Save the converted files to a list and load the saved list for subsequent conversion. Specify and entire directory folder to convert. Convert all worksheets of an Excel file to one SWF without losing any content, layout or styles. Support all versions of Windows and Excel.